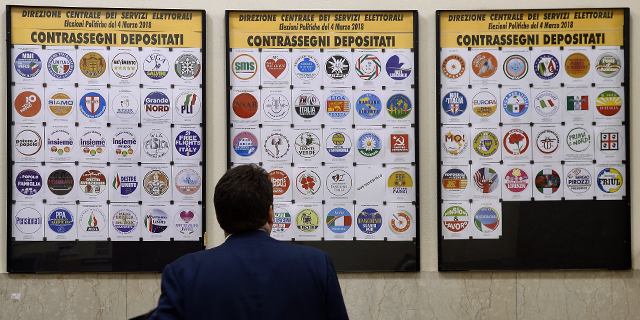 Pessimism and disaffection are widespread among Italians ahead of the country’s general election on Sunday. 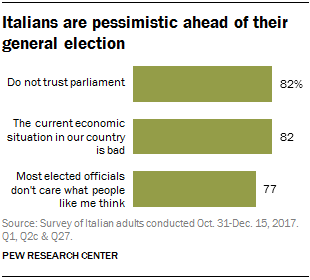 In a Pew Research Center survey conducted last fall, 82% of Italians said they distrust parliament and an equal share said the national economic situation is bad. About three-quarters (77%) said politicians don’t care what people like them think, including 59% who felt that way strongly. Supporters of the four largest parties contesting the election generally expressed negative views of the current environment. But those who identified with former Prime Minister Silvio Berlusconi’s Forza Italia, the right-wing Northern League (LN) and the populist Five Star Movement (M5S) expressed even deeper dissatisfaction than those who identified with the governing, center-left Democratic Party (PD). Italy’s economic and political troubles are well-known. It is one of a handful of countries in the Organization for Economic Cooperation and Development whose gross domestic product has yet to return to pre-financial crisis levels, and one of the main party leaders – Berlusconi – is campaigning despite being legally barred from holding higher office. While most Italians say the economy is doing poorly and parliament is not to be trusted, those feelings are more widespread – and felt more intensely – by those backing parties currently out of power. A majority of those supporting the Five Star Movement (65%), Northern League (64%) and Forza Italia (58%), for example, said they do not trust parliament at all, compared with only about a quarter of Democratic Party supporters (23%). And while Italians of all genders, ages, incomes and education levels said politicians don’t care about people like them, Five Star and Northern League partisans were among the most likely to express this sentiment: 71% of those supporting these two parties felt strongly that they were being ignored by elected officials. This view was shared by about six-in-ten supporters of Forza Italia (62%), but just 42% of Democratic Party backers. The issue of immigration has grabbed headlines in the run-up to the election, but the current tensions are not new. A 2016 Pew Research Center survey found that 65% of Italians viewed the large number of refugees leaving countries like Iraq and Syria as a major threat to their country, and more than half (53%) said having an increasing number of people of different racial, ethnic and national backgrounds made their country a worse place to live – one of the highest figures of the 10 European countries surveyed. The partisan divides over immigration within Italy are clear. Most people who supported the Democratic Party said immigrants strengthen the economy (71%) and do not increase the risk of terrorist attacks (60%). Most who supported the Northern League and Forza Italia, on the other hand, said immigrants are a burden on the economy (73% and 63%, respectively) and increase the risk of terrorist attacks (69% and 71%). Supporters of the Five Star Movement fell between these positions. Only on questions of assimilation do most partisans agree when it comes to immigration: At least seven-in-ten Italians in all four major parties say it is necessary for immigrants to adopt Italian customs and traditions.